GBPUSD has been fluctuating within the channel for almost 20 days. The support rests at 1.23800 with resistance at 1.24180 which both lines are below the weekly pivot point at 1.24340. 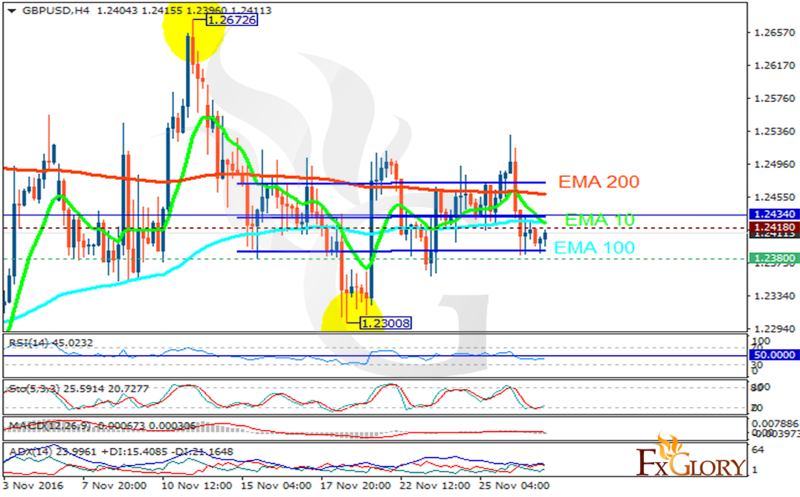 The EMA of 10 is moving with bearish bias and it has reached the EMA of 100 but both of them are below the EMA of 200. The RSI is rising towards the 50 level, the Stochastic is moving in low ranges while showing upward momentum and the MACD indicator is in neutral territory. The ADX is showing a weak sell signal. There are not enough signals to forecast the trend’s direction however there is a possibility of downward attempt targeting 1.2300.